castle beyond the looking glass, hell yes. this is hands down my favorite inuyasha movie out of the four, having watched it multiple times. 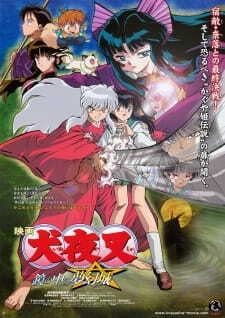 this movie unlike some movies based from anime, does have a more direct tie to the show itself which made it enjoyable and familiar being a HUGE inuyasha fan myself. the art was fantastic, it had the hd like look to my favorite characters and all original voice actors were in so i was super happy. all the character acted to their lovable personalities that i loved so much. hands down, i love this movie for everything though it had a fantastic ending and play up to the point where i would HIGHLY suggest any inuyasha fan to check this out! Having seen all the InuYasha movies, I feel this one is by far the best of them, and most memorable. I've always liked how InuYasha incorporates the history and lore of Japan's past eras. This particular movie has excellent art as opposed to the first which was older, but not only did the quality of the art improve, there was much more action and intensity in the animation. This is the only one of the movies that actually have the main antagonist of the series itself, Naraku, in it and I feel that it contributes to the plot a lot, having him as an antagonistic device other than Kaguya. It's all about him deceiving people and bringing his plans to fruition as usual, and he always has an excellent way of carrying those plans out. An interesting thing about this movie as well is the use of poetry. In the process of releasing Kaguya. I found that superb. There were several moments in the movie where I would get chills even having seen it two other times. That's how exciting and intense this movie was to me. Of all the movies, this is definitely the one worth the watch. I give a 9/10! It's great!